Today's Featured Stamper over at SCS is Jami... Sgt.Stamper.... yeah!!! I love Jami's work and she is a sweetheart besides! 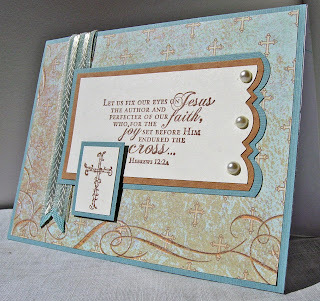 I especially love her Scripture based cards and her house mouse cards. She has a style that I just love! I used Jami's basic layout but changed everything else. I used this great designer paper by Flair Designs. The stamps I used are from Our Daily Bread Designs, and I used a double ribbon treatment: one is Martha Stewart and one is from Hobby Lobby. The aqua cs is Bazzill Basics and the Kraft is an unknown Kraft I have had for a while. I love the verse here... it amazes me to think that Jesus counted it JOY to endure the pain, suffering, scorn and rejection, and ultimately the cross for me and you! THAT is love! Thanks so much for stopping by today! I hope you have a wonderful Sunday! Hello, Do you have scripture verse stamps to sell? I have lot but always looking for new ideas of encouragement. This is gorgeous!!! I just purchased that border punch myself and really LOVE how you've used it here ... very clever! Thanks for commenting on my blog and linking me here to yours! You did a wonderful job on the header ... way to go!! It's looking good ... keep up the good work! This is just beautiful, Grace! I love your blog, and all of your creations. They are truly inspirational. We travel to NC every year for a family vacation, (Since I was five) so it has been over forty years. We stay on the ocean in Cape Hatteras, you are so blessed to see the North Carolina sunset out your window every morning. This turned out so pretty and elegant. I'm always looking for ways to use sentiments as the main focus of the card and I really like what you did here.